Running numbers: 3252 - 3291, 3312 - 3331. 1898-99 (3312 - 3331) to lot number 113. While Dean required express passenger locomotives with large driving wheel diameters, as exemplified by the 7 feet 8 inch drivers of the 'Dean Singles', a rather different engine was needed to work over the hills of Devon and Cornwall. In 1895, 4 - 4 - 0 number 3252 Duke of Cornwall was produced with 5 feet 7½ inch driving wheels and a boiler with a flush round top firebox with a very large dome on the back ring of the barrel (known as the S4 boiler). 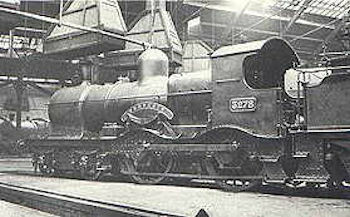 It was also the first Great Western engine to be fitted with an extended smokebox, the length of which was 5 feet 0 7/8 inch. From 1898, thicker tyres were fitted onto the class producing driving wheel diameters of 5 feet 8 inches while the bogie wheels increased to 3 feet 8 inches. Regarding the bogie wheels, the first forty engines and the first twenty-five tender wheels were of the Mansell type constructed with teak inserts between the rim and the centre. These were replaced after a few years by normal wheels. Similar to the Dean Singles, very large clackboxes were fitted to the side of the barrel carrying feed water to the boiler. As with the later 'Badminton' class, the frames were curved around the driving wheels. For some reason the class was named originally after the second engine of the class, 'Pendennis Castle', but this dropped some years before the emergence of the 'Castle' class, however, the class were also known as 'Devons' from the area that they first worked. On these early engines of the 'Duke' class, the nameplates were mounted on the sides of the barrel. The last twenty members of the 'Duke' class were produced in 1898/9, fifteen of which were very similar to the earlier 'Dukes', although the very large clackboxes had been replaced with a smaller pattern with vertical feedpipes and the position of the straight nameplates was altered to the side of the firebox. The other five engines produced at this time were of two boiler designs; four engines were fitted with raised Belpaire fireboxes (numbers 3328 - 3331) while one engine, number 3312 Bulldog, was fitted with Churchward's prototype Standard number 2 parallel boiler in addition to the use of a screw reverse instead of the steam apparatus fitted to the other 'Dukes'. 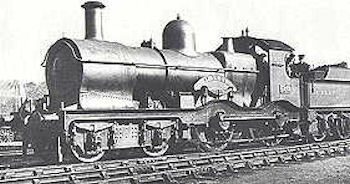 Churchward's experiments on boiler designs came to the fore after the introduction of the 'Dukes' and several boiler types were fitted to some of the class. Types of boiler ranged from the BR4 with a raised Belpaire firebox and the large dome on the back ring to the BR0, again with the raised Belpaire firebox but without the dome. Eventually, the S4 boiler with a flush Belpaire firebox but retaining the large dome was made standard throughout the class initially with number 3315 Comet, although fitting dates of this boiler ran from January 1905 to March 1929. At the same time, wider cabs were introduced onto the class. The tenders on the first forty 'Dukes' were a small 2,000 gallon design weighing 27 tons 7 hundredweight, whereas the tenders of the last twenty engines was a larger 2,500 gallon type weighing 34 tons 5 hundredweight. From about 1930, Churchward 3,500 gallon tenders were utilised on some engines, however, the width of these tenders was larger than that of the cab producing severe draught problems for the train crew. To counter this, the cab side sheets were set outward at the back to give a smooth flow of air between the cab and the tender. Superheating was fitted from 1911, initially of the two row 12/72 type, but later altered to the single row 6/48 and 6/36 design. Top feed was added from 1913. The straight nameplates were changed to the curved type from the end of 1903, mounted above the front driving wheel while later in 1930/1, Automatic Train Control was added to all of the class except numbers 3252, 3257, 3259, 3262 and 3277. In February 1902, 3273 Armorel was rebuilt with a Standard number 2 boiler. Between 1906 and 1909 a further nineteen 'Dukes' were fitted with this boiler including number 3312 Bulldog which had been originally built with the prototype Standard number 2 boiler. These twenty engines were the first members of the 'Bulldog' class. Renumbering of the class took place in 1912, so that the 'Duke' class were given numbers 3252 - 3291 whereas the initial twenty Bulldog's were renumbered 3300 - 3319. When number 3265 Tre Pol and Pen was withdrawn in December 1929, some parts of this engine and a spare 'Duke' boiler were fitted on the straight 'Bulldog' frames of number 3365 withdrawn the following month. This produced the first member of the 3200 'Earl' or 'Dukedog' class. As stated at the beginning, the class were originally built for the gradients in Devon and Cornwall and they worked all of the important trainsbetween Exeter and Penzance until 1900, when the class were gradually superseded by 'Bulldogs' and the 4300 class moguls. Just prior to Grouping in 1923, the class were spread evenly through not only the South - West of the country but also in Reading, Didcot, Bristol and Shrewsbury working the local and branch passenger services with a fair amount of lighter goods traffic. After Grouping, the 'Duke' found a niche on the Cambrian main line where the elderly Cambrian Railway 4 - 4 - 0's were found to be inadequate. In addition, many travelled to Gloucester and Cheltenham replacing the old 2 - 4 - 0 engines. Withdrawal of the class began in March 1936 with numbers 3263 St. Michael and 3288 Mendip although the first twenty-nine withdrawn 'Dukes' were rebuilt as 'Dukedog' locomotives. The plan was to rebuild all forty members of the class, but the scheme was shelved at the outbreak of World War II. After the war, the eleven 'Duke' survivors were renumbered into the same series as the 'Dukedogs', and similarly painted after 1948 in plain black. With the arrival of the 'Manors' in the Central Wales Division in 1950, the days of the remaining 'Dukes' in service were numbered. The last 'Duke' in service was number 9089 (ex 3289 St. Austell) was withdrawn in July 1951. Specifications (Later B4 boiler with superheater).